7-in-1 camera lens kits enhance camera capacity and create marvelous pictures. It's easy to put in the pocket and go out for fun! - 0.63x wide camera lens for iPhone 7 plus capture 45% more picture. - 0.36x super wide lens capture 120% more picture. - Features: Macro lens iPhone 6 gets clear details for small objects. - iPhone 7 zoom lens gets up close with 2x optical magnification. - iPhone lenses for iPhone 6 takes you into a stunning fanny world. - Filters polarized light, reducing reflections, enhancing colors and increasing contrast. - Lens is adjustable for effect of polarization. - Fit for iPhone, Samsung and Android smartphones. - Make sure the iPhone 7 lens kit center overlap & parallel with phone camera. 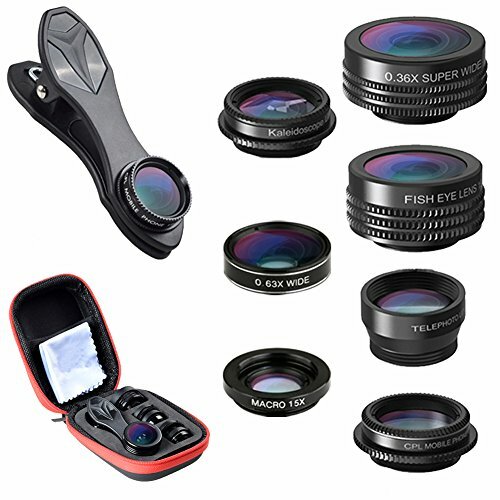 7 pcs iPhone lens kit in 1 kit: 2x zoom telephoto lens, 198° fisheye lens, 15X macro lens, 0.63X wide angle lens, 0.36X Super Wide lens, Circular polarized lens (CPL lens) and Kaleidoscope lens. Shooting artwork pictures by using your smartphones with our iPhone lens attachment, enjoy the high quality technical image effect. Fall in love with photography: Fisheye Lens create funny circular pictures. Wide Angle lens allows you to capture larger scenes like city scene and group shot. Macro lens capture amazing close-ups like flowers. Kaleidoscope Lens shows you an overlapping vision. Telephoto zoom lens for shooting distance pictures, CPL lens eliminate reflected light and create beautiful color. Wide angle lens and Macro Lens in a 2-in-1 Set: These two smartphone lens kit are screwed together for easy storage. To use the wide angle, simply attach both lenses to the clip provided. To use the macro lens, simply unscrew the wide angle lens. Easy to use and carry, just screw the iPhone camera lens onto the clip and clip to your phone. With soft rubber, no damage to your device, guarding against bumps and scratches. Close-packed and handy potable case. Wide Range of Compatible Devices: Portable, removable and solid clip-on design that attaches to almost all smartphones including iPhone 8, 7, iPhone 6S, 6S Plus, iPhone 6, 6 Plus, iPhone 5S, SE, Samsung Galaxy S6, S6 Edge, S7,S7 Edge, S8, HTC, Sony, Xiaomi, Huawei, LG Android smart phones. If you have any questions about this product by ATFUNG, contact us by completing and submitting the form below. If you are looking for a specif part number, please include it with your message.